Samsung UE40ES8000 review | What Hi-Fi? Many TVs take advantage of smartphone functionality to have their own control apps alongside the traditional remote. Samsung has gone even further with the 8000 series, including this UE40ES8000, adding motion gesture and voice control to the list of ways you can navigate your set. While these new control methods work fine, the novelty soon wears off. We were happier using either of the two remotes – a traditional unit with a backlight, and a Smart Touch Control, both of which work efficiently. This set has a camera built in – useful for Skype video calls. It also uses face recognition software to sign in to personalised apps/accounts such as Twitter. Samsung’s user interface is slick and it makes the Smart Hub and Smart Apps portals fun to use. There are loads of features, from the regular film, TV and music-on-demand services such as YouTube, BBC iPlayer and Acetrax, to Samsung’s own family and lifestyle apps. You can also access media stored on NAS devices, computer, smartphones or USB stick over a home network via the built-in wi-fi or ethernet connection. The Samsung UE40ES8000’s thin-bezel frame and curved stand make for an elegant set. Even more impressive is the picture quality. 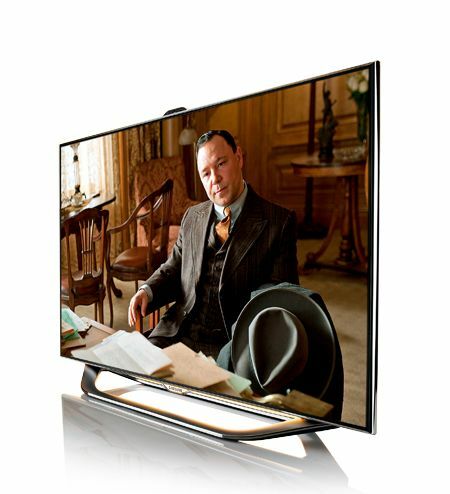 This TV comes equipped with both Freesat and Freeview HD tuners; while Freesat channels are crisper, Freeview HD looks good as well, with BBC HD looking clean and sharp. Fine details are dug out of every image, a trait even more evident when you play Blu-ray discs. Colours are rich and textured without straying too far into overblown territory, while the contrast between deep blacks and sharp whites is strong. The Panasonic TX-P42GT50 still has better low-level detail without compromising the depth of black, but in brighter scenes the Samsung edges ahead at displaying tiny details. Samsung UE40ES8000: 3D performanceThis detail helps when watching in 3D, where great depth levels and stable motion make this active 3D set easy viewing. Two pairs of lightweight active glasses are included. We play the Mission Impossible: Ghost Protocol DVD to test the set’s upscaling. It’s a surprisingly faltering performance: it’s a decent picture, but there’s a hint of graininess and the colours aren’t as exciting or convincing compared with its handling of Blu-rays – or with the upscaling talents of the Sony set. We’d leave the upscaling duties to a decent Blu-ray player. Sound is on the usual thin side, with dialogue unclear until you increase the volume. There are sound modes to try: Clear Voice enhances dialogue but surrounding noise is then compromised, while Amplify aims to make a bigger, punchier sound, although things get a bit too harsh. There are different picture modes too, but we saw no real benefit in using them. The 40ES8000 is one of the more expensive sets we've tested at this size, but it is bristling with features. Its comparatively poor showing with DVD upscaling gives other sets a certain edge, but it’s a gorgeous screen that certainly sets a high standard.